It’s essential that you use good practice when you store, handle or dispose of waste oils, especially those that are classed as hazardous or special waste. There are many types of oil and their properties, which may have changed during use, dictate how they are classed when they become waste. Technical guidance to help you classify your waste can be found on GOV.UK. The most common waste oils, derived from fuels or lubricants, originally come from petroleum oil, sometimes known as mineral oils. Many lubricants may also contain synthetic components. But other common oils, including vegetable based materials used for cooking can become waste as well. Waste oil is harmful to the environment and some, for example used engine oils, may cause cancer, so it needs to be managed carefully. You may need to account for Health and Safety guidance as well as the environment. There are different legal requirements depending on where and how your waste oil was produced. All waste mineral oils are deemed hazardous waste; these may have additional legislation requirements. Household waste oils are normally produced in small quantities and are usually managed by local authorities who can offer specific advice on disposal options. If you transfer the oil from your household to a commercial company, for example if you take it to an oil recycling bank or civic amenity site, the place the oil is taken to becomes legally responsible for its storage and disposal. All waste oils produced by or collected from an industrial or commercial business activity are covered by waste oil legislation for their storage, transport, and recovery or disposal. Store waste oils separately to other wastes, this may be a legal requirement. It’s essential to make sure your waste oil storage is robust and safe so your oil is less likely to cause pollution before you can dispose of it. You should check if you need to meet minimum legal standards for waste oil storage. Keep all wastes in secure areas under lock and key and in containers that are vandal proof and safe from flood risk. If your waste oil is a lubricating oil, eg from a vehicle, make sure you put it into a container that isn’t damaged and has a secure lid. Don’t dispose of these oils with your normal household waste or recycling. They should be taken to your local household recycling site for safe disposal. Small quantities of waste cooking oils can usually be put into your domestic waste collection, check what your local authority can take. The oil may need to be put into a clear closed container and labelled as waste oil. Check the Oil Bank Line web site to find your nearest waste oil bank who may offer separate collection facilities for mineral and cooking oils. Never pour oil down a drain or onto the ground. If you have waste fuel to dispose of you need to be aware of the risk of fire or explosion. Don’t try to get rid of waste fuels yourself, for example by burning or adding to a home heating oil tank. Contact your local authority or a member of the Oil Recycling Association and ask for disposal advice. It will help if you can describe as accurately as possible what the waste fuel you have is and how much you have. Is it petrol or diesel, home heating oil or maybe a mix? If you’ve put the wrong fuel in a vehicle don’t turn the engine on, this could cause serious engine damage. Contact your local garage or motoring organisation for help and advice. Don’t try to drain fuel yourself; this is a job for professionals. If you’ve emptied a bottle or can that used to contain oil turn it upside down to make sure you use as much oil as possible from the container. Then, as long as there is a recycling symbol on the container, you should ask your local council for advice. Facilities for recycling empty oil containers vary between councils, so in some cases they can be included in household recycling and in others they may have to be disposed of with general household waste. 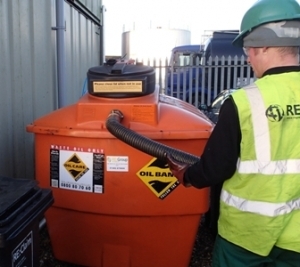 Many local councils have a collection tank for used oil or waste oil at their recycling centre. Sometimes there’s a collection point for the empty oil containers next to this waste oil tank so they can be recycled separately. The staff at recycling centres will be able to tell you what to do with the empty oil bottle where you live. There are legal requirements you must meet if you produce or store waste, collect or transport waste (carrier) or receive waste for recovery, recycling or disposal as a waste receiver (consignee). Waste mineral oils and waste cooking oils can have value; although this can be very variable. Companies offer collection services as they can be treated to recover valuable components or, in some parts of the country, used as a fuel at authorised sites. You should not dispose of waste oils from your business or commercial premises at a household civic amenity site. If you are unsure about the rules that apply to your business contact your environmental regulator or the Oil Recycling Association. For waste cooking oils from the catering industry please see Food Standards Agency guidance.